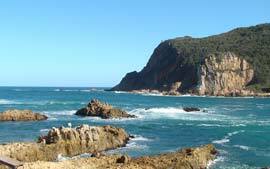 Sun Valley Place | Self-catering holiday accommodation on the Knysna Lagoon. A true home from home affordable holiday. 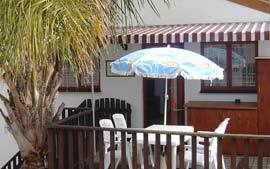 Situated within a private residential property on the beautiful and world famous Knysna Lagoon and set between palm trees and an exotic garden “Sun Valley Place” can accommodate up to four persons. This is an ideal holiday/vacation destination for families who enjoy tranquillity, being near the water, fishing and boating. Its unique location, own entrance, elevated position and its complete separation from the main residence makes it very private and is perfectly suited for couples and honeymooners. It is close to all amenities like Golf Courses, Beaches, Forest Walks, Mountain Bike Trails, Lagoon Ferries, Whale Watching, etc and is also within walking distance of the centre of town, shops and restaurants. “Sun Valley Place” always welcomes you with a complimentary tray of tea, coffee and biscuits. A basket of seasonal fruit also welcomes our pre-booked guests on arrival. 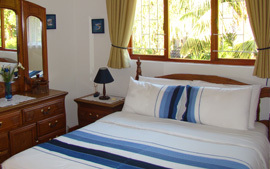 For a genuine value for money vacation contact your hosts Marion or Loucas.